According to Tile expert, Ryan Fasan the tile industry – especially the Tile of Spain manufacturers – are in a renaissance period. Spanish technology is driving innovation from every facet. For instance, ink jet printing is providing limitless opportunity for design customization and to reinvent organic themes such as wood and marble. Thin tile offers large wall and floor formats and new dimensional shapes. Eco-friendly advances include recycled tile, tile that absorbs pollution or tile that provides an energy efficient surface that’s warm to the touch. Last week’s two hour event was packed with information not only from the manufacturers themselves – but also award winning architecture from Spanish architect Ángela García de Paredes – Principal, Paredes Pedrosa Arquitectos, Madrid, Spain that demonstrated how material and nature are important design considerations. Dr. Martin Bechthold – Professor of Architectural Technology/ Group Head, Graduate School of Design, Harvard University shed light on integrating robotic technology into fabrication and construction processes, developing advanced material systems and understanding problems of lifecycle design. Andie Day, local designer/blogger moderated a lively design forum where architects and designers could ask the speakers specific questions regarding their projects. 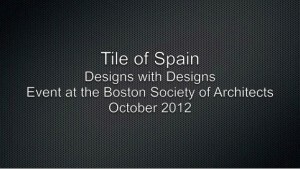 The well-attended CEU event was sponsored by the Tile of Spain and held in the new BSA (Boston Society of Architects) Space in Boston.